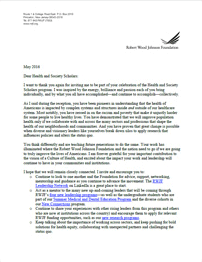 The RWJF Health & Society Scholars program is designed to build the nation’s capacity for research, leadership and policy change to address the multiple determinants of population health. The program is based on the principle that progress in the field of population health depends upon collaboration and exchange across disciplines and sectors. Each year, the program enables up to 12 outstanding individuals who have completed their doctoral training to engage in an intensive two-year program at one of four nationally prominent universities. This report details the history of the HSS program. Program documents, interviews, and statements at meetings were used to assess the strengths and weaknesses of the program and to explore its perceived impact on the scholars, the faculty involved, the universities that hosted sites, and the field of population health. To address concerns about the future of training in this interdisciplinary field, the IOM Roundtable on Population Health Improvement commissioned this report on training the next generations of scientists in this nascent field.